After reading Emergence: The Connected Lives of Ants, Brains, Cities, and Software by Steven Johnson, and Adversarial Design by Carl DiSalvo, I started to think about a project that incorporates some of the themes introduced in these readings. What I found interesting in the aspect of emergence, is how complex behaviors emerge from simple organization. In Johnson’s terms, emergence is a “movement from low-level rules to higher-level sophistication”1. In nature we can observe how various organizations form very complex systems that emerge from relatively simple behaviors. Ants are a perfect example of can animal that embraces these types of organizations. But with ants in particular, it is interesting to note how they are individually linked to a collective swarm network. The ant colony emerges into a sort of a conscious organism that becomes aware of it’s internal and even economical health. This allows ants to proactively respond to dangers that threaten the whole colony through the interfaces of its informational network. This led me to think about how humans can develop a collective network that can be as effective as the one of ants. We are linked by a network called the Internet, but are we sophisticatedly integrated into it? We use powerful electronic devices to connect to the Internet through high-bandwidth speeds, but our interactions with these devices are made using our low-bandwidth biological limbs. The Internet is an unnatural network that was engineered without the help of nature’s selective processes. This translates into a human incapability to communicate by thought, intuition, and collective perception using an artificial network like the Internet. Humans might one day be able to replicate the engineering feats of nature, but thus far, networks like the Internet — are minorities when compared to some of the networks that where engineered by nature. I started to think about how we can integrate our behavior so that we can proactively respond to treats just like ants. At an age of climate change and multiple humanitarian crises, these might be traits that are worth introducing. This is where Carl DiSalvo’s Adversarial Design served as a direction point for the ideas of this project. What is particularly interesting about the notion of adversarial design, is that it probes social and political issues with the help so called “ubicomp” devices2. These are devices that are integrated into human behavior that allow environmental and social problems to become more perceptible. I decided to think of a device that manifests certain aspects of adversarial design for the sake of re-designing human behavior. But before such a device can be designed, it is important to understand the immensely complicated feedback mechanisms in our brains. In Johnson’s Emergence I was intrigued by his own experience when visiting the doctor to examine his adrenaline system3. At the end of the session, the doctor complemented Johnson for having a healthy adrenaline system except for the six or seven dramatic spikes that occurred on the graph. Each of the spikes corresponded to the jokes that Johnson made during the session. The doctor mentioned that these spikes signify a healthy relationship between his adrenaline system and natural instinct. But Johnson’s objective conclusion for these adrenalin spikes is quite startling. He concluded that his brain was “addicted” to jokes because they caused a dose of adrenaline to be released into his bloodstream. Johnson’s brain enjoys this small adrenaline rush and is what caused Johnson to eventually become “addicted” to jokes. This addiction in turn, formed a personality — which can be generalized as a person who likes making jokes. 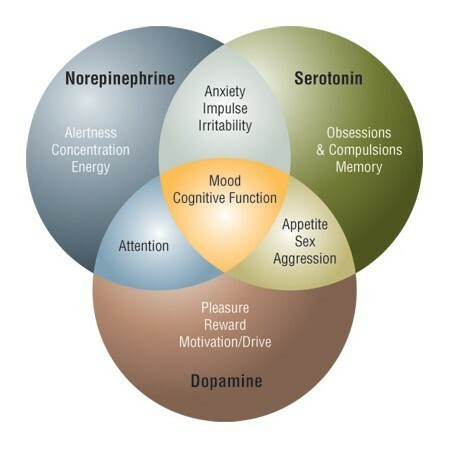 Adrenaline together with serotonin, dopamine, norepinephrine, among a dozen other types of hormones and substances, function as a reward system of the brain. Based on the actions we make, we are rewarded with certain levels of these substances. Different combinations of these substances produce more complex forms of emotions. But getting used to a particular action means that our brain is dependent to the substances that get released when an action gets fulfilled. This substance dependency is what forms the complex feedback mechanisms of human personalities. Our unconscious behavior and personalities are almost entirely dependent on these feedback loops. The realization that the brain is substance dependent, led me to think about ways to take advantage of these feedback mechanisms. That is, train ourselves to follow certain practices that we fail to consider in our conscious decisions. The conscious decisions that humans might want to train themselvs to, are the ones that benefit the environment. These include decreasing the carbon footprint, compartmentalizing waste, or decreasing consumerist habits. To do so, it is necessary to create a device that rewards our brain with a positive feedback and negative feedback substances. In other words, we can take advantage of our brain’s substance addiction and re-design our behavior to be more environmentally friendly. Just like Johnson is addicted to jokes, we can train ourselves to become addicted to actions than are beneficial to the social and collective environments. In order to take advantage of the human reward system it is necessary to effect the brain using a particular substance. That is, somehow release it into the body’s bloodstream. But some sort of a device that is attached to a subject’s body is necessary for such a feat. Devices that release substances into the bloodstream already exist in а form of insulin implants that are actively used by diabetics. By injecting insulin into a diabetics’s bloodstream, the device does not alter the behavior of the patient, but does provide an important functionality for the patient’s health. But instead of using insulin, other substances could be released that would effect our brain. 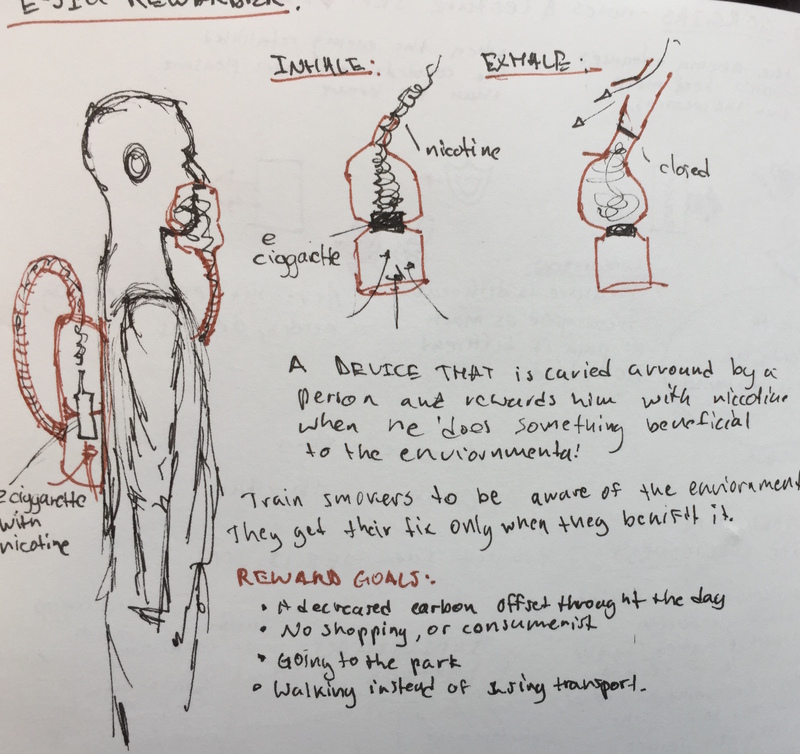 I began thinking of ways how to feasibly experiment with a device that can somehow release substances into my bloodstream in a controlled manner. By controlling the moment when the substance gets released, I can create a device that analyzes my actions based on how beneficial they where to the social and collective environments. If it registers an action that benefited these environments, a substance will get released by the device. My brain will then become addicted to this substance, while I develop an urge to satisfy this addiction by making environmentally friendly decisions. I have looked at a few brave experimenters who inserted a biochip implant under their skin. While I take it as an inspiration, I don’t think the benefits would outnumber the health hazards that such an experiment can pose. But those aside, such a device seems like an intriguing solution. Instead of injecting substances into my bloodstream directly, I can think of some other ways that I can do so by using safer methods. I thought about substances that people are addicted to, such as nicotine, sugars, and alcohol. What if I expose myself to these substances based on how good my behavior is? What if I train myself to do certain actions by becoming addicted to one of these substances? Electronic cigarets seemed to be an intriguing option. Especially since the global population contains a significant portion who smoke. It would certainly be safer to build a device that functions based on a commonly used product as opposed to using some sort of a hazardous syringe. What if I use the electronic cigarette to release nicotine smoke based on how environmentally friendly my behavior is? I started thinking about a device that can be worn as a backpack. There would also be a hat with cameras and an embed computer that will analyze my actions. Whenever the device registers a beneficial action, it will release a rewarding dose of smoke containing nicotine which I will then inhale. The device will incorporate a breathing mechanism. While wearing it, I will inhale and exhale the outside air as I do normally. But whenever I commit an action that benefits the environment, I get rewarded with a dose of nicotine. My substance dependency will drive my brain’s decisions to care for the environment that I existentially depend on. We should all take advantage of our substance dependencies and use them for the benefit of our environments instead to pursuing our superficial necessities. Such a submission of course, will always remain voluntary to the user.